Happy Marriage: Dream or Reality? is filled with insightful and practical ways to build—or rebuild—an exciting, fun, and loving marriage. There are also keys to raising godly, respectful children. Pastor Joe Okedi shares years of experience as a Christian marriage counselor. - Why marriages fail and how to make yours succeed. - The seven pillars of a successful marriage. - How to enjoy—not just endure—your marriage. - God’s covenant power to bless and protect marriages and families. - Hope for overcoming childlessness. These highly researched, tested, and proven principles will work for anyone who cares to read and apply the wisdom. This book will change your marriage and family forever! Marriage—An Accident Waiting to Happen? The chasm between the biblical vision of marriage and the common human conception is—and has always been—gargantuan. Modern culture, for instance, would make you believe that everyone has a soul mate; that romance is the most important part of a successful marriage; that your spouse is there to help you realize your potential; that marriage does not mean forever but merely for now; that starting over after a divorce is the best solution to seemingly intractable marriage issues. All these modern-day assumptions are in a word wrong. 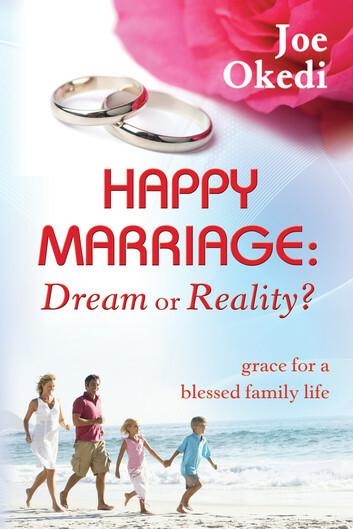 Using the Bible as his guide, coupled with insightful illustrations, Pastor Okedi delivers the Happy Marriage: Dream or Reality?—an extraordinary, insightful look at happiness in marriage that will inspire Christians, skeptics, singles, long-time married couples, and those to be engaged. Also underlining the theme of the book is the message that God created marriage to bring us closer to Him and to bring more joy into our lives. Are you and your spouse struggling to keep your marriage alive? Or are you planning to enter into a married relationship? Or are you yearning to lift your marriage to the next level? Pastor Okedi’s revealing and wise insights about marriage are what you need. I have found great value in the book. Reading this book may turn out to be the wisest thing you have ever done.